The MovingPhotos3D screensaver sends your photos flying around in three dimensions. You can see hundreds of pictures form cities, spheres, and other shapes. Uses your iPhoto library, Aperture 3 library, or photos from any folder you choose. Mac is a trademark of Apple, Inc., registered in the U.S. and other countries. 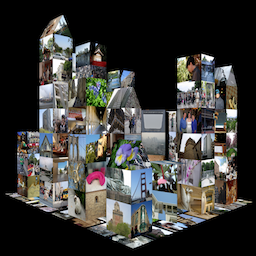 MovingPhotos3D screen saver, and these web pages, copyright David McNerney.